Officers Memorial Fund’s “Officer of the Month” award. On the evening of September 28, 2015, shots rang out in the violence-plagued south side of Chicago. 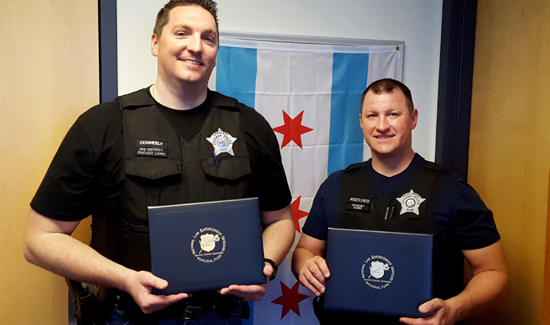 Officer Michael Modzelewski and then-Officer John Conneely responded to a drive-by shooting that left five people with gunshot wounds. The officers were immediately met by a woman carrying an 11-month-old child with a wound on his side. Chicago Police Department protocol states that officers should wait for an ambulance to take victims to a hospital, but when Officers Conneely and Modzelewski radioed for one, they were told nothing was available—all ambulances in the area were en route to other scenes. The officers felt they had no choice but to violate the protocol and take the child to the nearest trauma hospital immediately. “I don’t think that there’s training out there that can prepare you for something of this magnitude,” Officer Modzelewski said. Officer Modzelewski secured the crying infant in the back of their patrol car while continuing to apply pressure to the wound. Officer Conneely drove several miles to the hospital while staying in constant radio contact with dispatch. In addition, he informed his sergeant of the crime scene details. While en route, the officers were able to notify the hospital of the child’s wounds, current condition and estimated arrival time. The child survived the shooting and emergency room doctors credited the officers with saving his life with their decision-making and communications skills. Unfortunately, the infant’s pregnant mother and grandmother were shot and killed during the drive-by. Officers Conneely and Modzelewski were not disciplined for their actions. “I think at the end of the day, we knew in our hearts that we made the right decision,” Officer Conneely said. Well done and may God bless you both.